50K of mountain bi king, running, kayaking, and ropes courses. 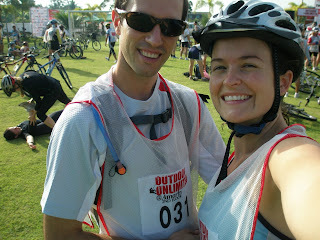 Daniel and I headed out to experience a lot of mud and miles! We had a blast! 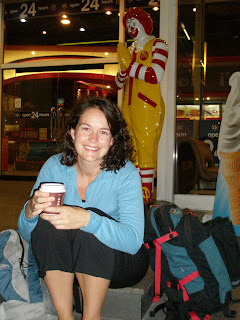 The morning started at 4:30 with coffee from Ronald and a bus trip about an hour outside of Bangkok. The sun started to come out as did hundreds of other competitors. 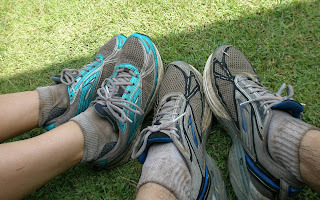 Not knowing the distances or any information about the course, we didn't know what to expect. (I guess that's part of the adventure) We got our bib #'s and jerseys on and listened to race instructions. As the gun we nt off we started off on the bike. 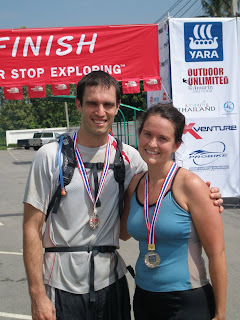 About 7 miles of mud, rice fields, wooden bridges, and narrow tracks led us to the 1st section of running. It was a flat 4 mile run through tall grass, rice fields, and mud puddles. 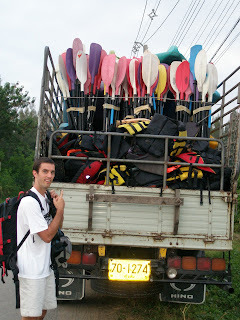 After that, we got back on the bike for another 5 miles that led us to a river where our kayaks waited for us. 1.5 mile row down stream really helped us pick up some time and pass some other competitors. A 1.5 mile run back to our bikes, we headed out for a long 12 mile ride through more rice fields, mud and various villages of Thai people and tons of little kids cheering us on! Feeling really tired we approached t he ropes courses that had us crawling up over a cargo net, then climbing a tree to across a stagnate stream of water using a single r ope over our heads and another for our feet. We had to go hand-over-hand, foot-over-foot to the other side. Or, we could have just swam across, but we could see by the looks of water, we wouldn't like that. Running about a half mile to the lake, we were trying to recover from rope burns and sheer tiredness. We arrived to a lake where we were handed an inner tube and were instructed to swim (fully clothed) across the lake, about .25 miles. Weighed down by clothes and shoes and pushing the tube across, we got irritated and couldn't imagine this race going much longer. Exited the water we saw that we had to finish the race with a 1 mile run, with the inner tube. The finish line looked great while running up the hill, rolling the tube. 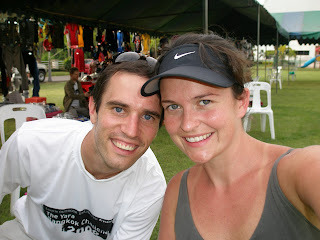 Having NO clue what our time was, we were extremely impressed when we crossed the finish line in 4 hours and 20 mins. In the top 20 and 4th in our division! We were stoked and ready for the next one!